HAMPI, INDIA - 28 JANUARY 2015: Man standing in the river and washing his clothes in water. HAMPI, INDIA - 28 JANUARY 2015: Men washing tractor parked in a river. 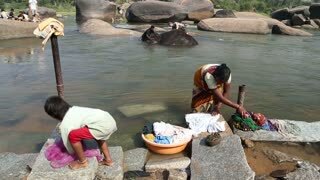 HAMPI, INDIA - 28 JANUARY 2015: Woman at the riverbank and washing clothes with children playing around her. HAMPI, INDIA - 28 JANUARY 2015: Close view of woman and child washing clothes. HAMPI, INDIA - 28 JANUARY 2015: Woman and child washing clothes, man washing elephant at the river. HAMPI, INDIA - 28 JANUARY 2015: Man standing in the river and sinking his clothes in water. HAMPI, INDIA - 28 JANUARY 2015: Man sitting in the river and washing himself. 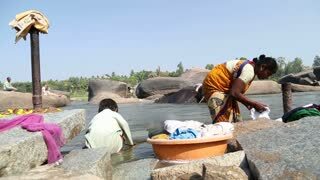 HAMPI, INDIA - 28 JANUARY 2015: Woman washing cloth while she stand in the river. HAMPI, INDIA - 28 JANUARY 2015: People washing clothes on the shore of the Tungabhadra river in Hampi. 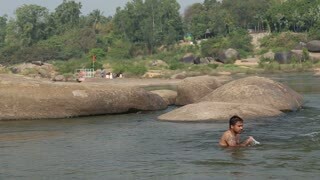 HAMPI, INDIA - 28 JANUARY 2015: Men bathing and washing their hair in the river.